Goldleafing a dream / music by Phillip Wilcher. Phillip Wilcher Rachel Tolmie, John Martin 3 mins, 28 sec. 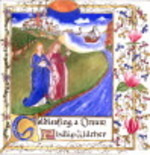 Dream song (2009) for oboe and piano. Phillip Wilcher Rachel Tolmie, John Martin 2 mins, 5 sec. Phillip Wilcher Amanda Muir, John Martin 3 mins, 23 sec. Phillip Wilcher Amanda Muir, John Martin 3 mins, 30 sec. Phillip Wilcher Rachel Tolmie, John Martin 2 mins, 45 sec. Phillip Wilcher Rachel Tolmie, John Martin 2 mins, 28 sec. Phillip Wilcher Rachel Tolmie, John Martin 3 mins, 21 sec. Phillip Wilcher Rachel Tolmie, John Martin 2 mins, 10 sec. Phillip Wilcher Amanda Muir, Rachel Tolmie, John Martin 2 mins, 15 sec. Phillip Wilcher Rachel Tolmie, John Martin 4 mins, 52 sec. Phillip Wilcher Rachel Tolmie, John Martin 3 mins, 11 sec. Phillip Wilcher Rachel Tolmie, John Martin 1 mins, 35 sec. Phillip Wilcher Rachel Tolmie, John Martin 1 mins, 37 sec. Phillip Wilcher Rachel Tolmie, John Martin 3 mins, 54 sec. Phillip Wilcher Rachel Tolmie, John Martin 5 mins, 52 sec. Phillip Wilcher Rachel Tolmie, John Martin 5 mins, 6 sec. Phillip Wilcher Rachel Tolmie, John Martin 7 mins, 13 sec. Phillip Wilcher Rachel Tolmie, John Martin 2 mins, 22 sec. Phillip Wilcher Rachel Tolmie, John Martin 2 mins, 21 sec. A vast music and magical journey of many genres and styles for oboe, cor anglais, flute and piano composed by Phillip Wilcher and sensitively performed by Rachel Tolmie (oboe, cor anglais), Amanda Muir (flute), and John Martin (piano). Score & Part: Stanza : for violin and piano / Phillip Wilcher. 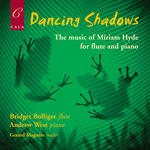 CD: Dancing shadows : the music of Miriam Hyde for flute and piano / Bridget Bolliger flute, Andrew West piano, Gerard Maguire reader. 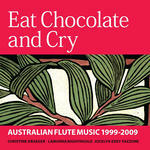 CD: Eat chocolate and cry : Australian flute music 1999-2009 / [performed by] Christine Draeger, Lamorna Nightingale, Jocelyn Edey Fazzone. 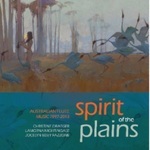 CD: Spirit of the plains : Australian flute music 1997-2013 / Christine Draeger, Lamorna Nightingale, Jocelyn Edey Fazzone.